Recipes for Peanut Butter-Sour Cream Bundt Cake with Butterfinger-Ganache Glaze, Blueberry-Lemon Bundt Cake and Sigrid’s Carrot Cake. In 1950, Nordic Ware founder H. David Dalquist invented a new cake pan with a round shape, fluted sides and a hole in the middle. 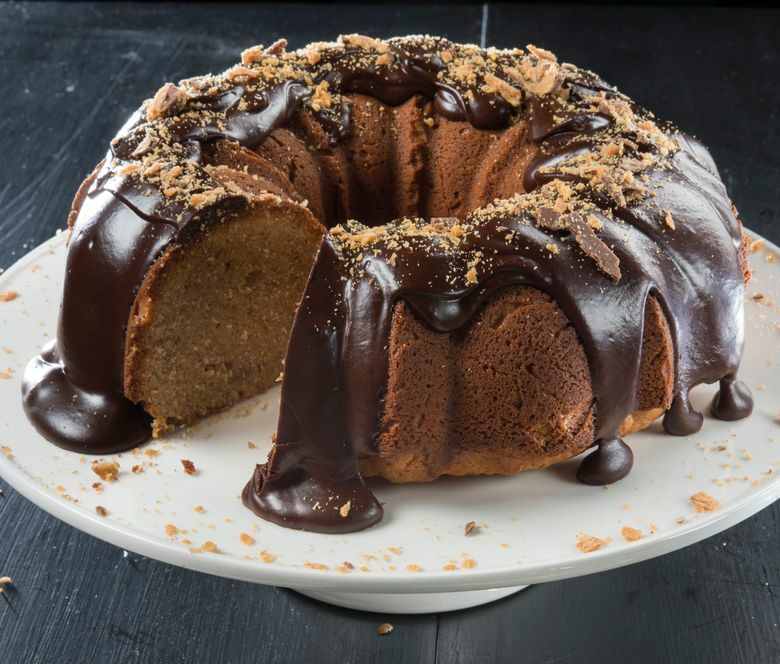 The Bundt pan was not a hit until 1966, when a Texas home baker won second place in a Pillsbury Bake-Off with her “Tunnel of Fudge” Bundt cake. The recipe had just six ingredients — butter, eggs, sugar, flour, walnuts and frosting mix — but its elegant shape with a ribbon of molten chocolate running through the center made a big impression. The Bundt pan has since become America’s best-selling cake pan, and, according to Nordic Ware, you can find the fluted tube pan in 70 million households around the world. In addition to the classic 12-cup design, Nordic Ware sells Bundt pans that resemble flower blossoms, hearts, cottages, castles and cathedrals. Sift through any baking aisle and you’ll find Bundt knockoffs called “fluted tube pans” in a variety of shapes and sizes. • Choose a nonstick pan with a classic shape. Elaborate pans with small crevices tend to trap batter. • Before baking, grease the pan with vegetable shortening and flour. A pan release baking spray such as Baker’s Joy also works. • Don’t leave the cake in the pan for too long after baking or the bottom of the cake could bond to the pan. • Wait 1 hour before slicing . Otherwise the slices will be too soft and won’t hold their shape. 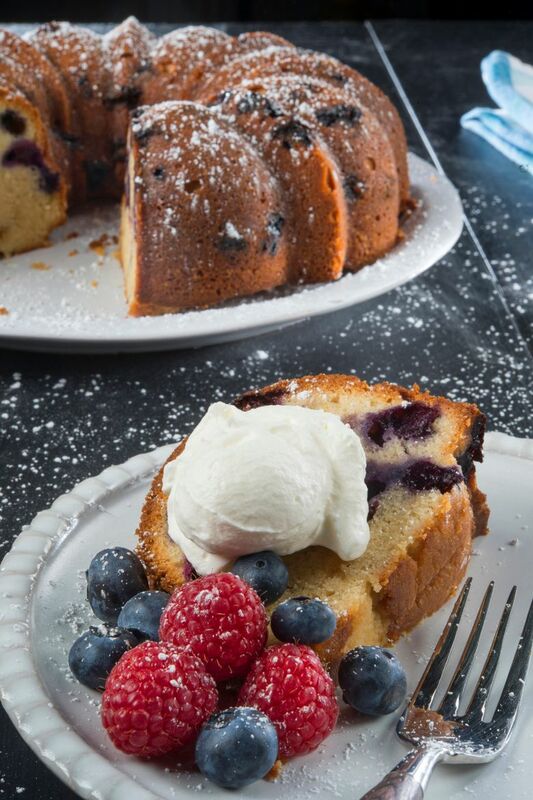 • If you’re paranoid about breaking your Bundt cake, freeze the baked and cooled cake in its pan. The cake will contract and pull away from the pan, so popping it out should be easy. Just thaw before slicing and eating. Abby Benson, a Lawrence, Kan., baker who learned to make Bundt cakes with her grandmother, has five of the pans in her collection. Benson uses the bakeware to make citrus-glazed pound cakes and chocolate cakes studded with pomegranate seeds. Benson, 28, likes Bundt cakes because they’re old-fashioned and beautiful even when unadorned. “It’s really a no-fuss cake,” she says. New York-based cookbook author Lauren Chattman, a former pastry chef who apprenticed under François Payard at New York City’s Daniel restaurant, is also sweet on Bundts. Her book “Cake Keeper Cakes” (The Taunton Press 2009) boasts 20 Bundt cake recipes, from basic Banana-Chocolate Chip to cornbread-like Blueberry-Cornmeal and decadent Peanut Butter-Sour Cream With Butterfinger-Ganache Glaze. 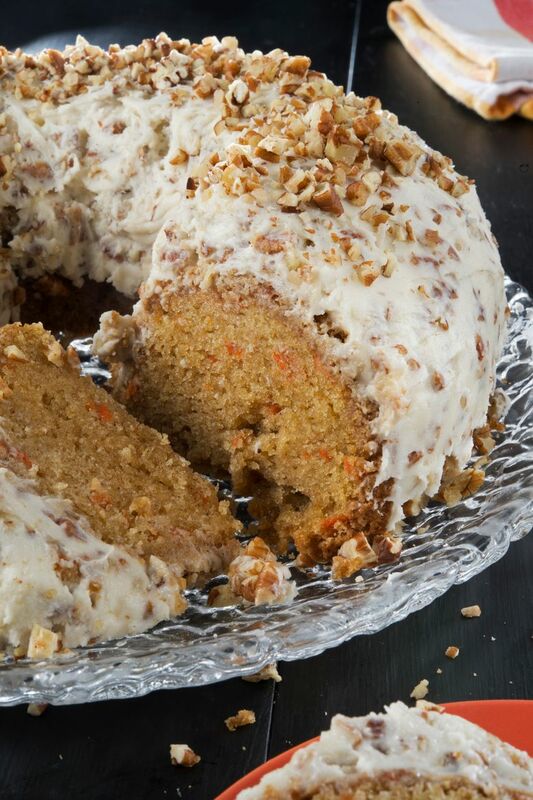 Bundt cakes are also versatile: They make excellent spice, carrot, fruit or poundcakes. Texas-based chain Nothing Bundt Cakes sells them in 10 flavors, including red velvet, cinnamon swirl, lemon and white chocolate raspberry. But there is one catch: Bundt cakes have a bad habit of sticking to the pan. And there are few kitchen disasters more dramatic and disappointing than a cake that cracks and crumbles into a hot mess as soon as you turn it out of the pan. She uses a paper towel to smear the shortening into all the crevices. “Just get messy with it,” she adds. Chattman said shortening makes pans more slippery than butter or cooking spray, which can overbrown the cake’s exterior. Just be careful to sprinkle on a fine dusting of flour, because any large chunks will show up on the finished cake, says Laura Laiben, owner of the Culinary Center of Kansas City, Mo. Laiben recommends using a spray that contains oil and flour, such as Baker’s Joy. The spray coats every curve of the pan in one step. When it comes to picking a pan, look for a nonstick surface in a rounded shape. “The more elaborate the pan, the more likely you’re going to have a problem with unmolding,” Chattman says. Glossy chocolate ganache crowns this firm, easy-to slice cake made with creamy peanut butter. 1. To make the cake: Preheat the oven to 350 degrees. Grease a 12-cup Bundt pan and dust with flour. 2. Whisk together the sour cream, eggs and vanilla in a large glass measuring cup. Whisk together the flour, baking powder, baking soda and salt in a medium bowl. 3. Combine the butter, peanut butter and brown sugar in a large mixing bowl and cream with an electric mixer on medium-high speed until fluffy, about three minutes, scraping down the sides of the bowl once or twice as necessary. 4. With the mixer on low, add a third of the flour mixture and beat until incorporated. Add half of the sour cream mixture. Repeat, alternating flour and sour cream mixtures and ending with the flour mixture, scraping down the sides of the bowl between additions. Turn the mixer to medium-high speed and beat for one minute. 5. Scrape the batter into the prepared pan. Bake until a toothpick inserted in the center comes out clean, 40 to 45 minutes. Let the cake cool in the pan for five minutes, then invert it onto a wire rack to cool completely. 6. To make the glaze: Place the chocolate and 2 tablespoons butter in a heatproof bowl. Heat the cream in a small saucepan over medium-high heat until it comes to a boil. Pour the cream over the chocolate and butter and let stand for five minutes. Whisk until smooth. 7. Pour the warm glaze over the cake, letting it drop down the sides. Sprinkle the chopped Butterfinger bar over the glaze. Let stand until the glaze is set, about 30 minutes. Slice and serve. Lemon zest lends fresh flavor to this springy Bundt cake, which pairs well with whipped cream and fresh berries. 1. Preheat oven to 350 degrees, with rack on bottom shelf. Butter a 12-cup Bundt pan; dust with flour, tapping out excess. 2. In a medium bowl, whisk together 2½ cups flour, baking powder and salt. With an electric mixer on high speed, beat butter, brown sugar and sugar until pale and fluffy, three to five minutes. Add eggs, 1 at a time, beating well after each addition. Beat in vanilla. 3. Reduce speed to low; add flour mixture in three batches, alternating with two batches of sour cream and beating until just combined. Toss blueberries and zest with remaining 1 teaspoon flour; gently fold into batter. 4. Transfer batter to prepared pan; smooth top with an offset spatula. Bake until a cake tester comes out clean, 60 to 70 minutes. 5. Transfer pan to a wire rack to cool 20 minutes. Turn out cake onto rack to cool completely. (Cake can be stored at room temperature, wrapped in plastic, up to three days). Dust with powdered sugar before serving, if desired. Slice and serve. A thick layer of cream cheese frosting flecked with pecans adds a halo of decadence to this dessert. Bonus: The frosting also conceals any cracks or imperfections in the cake. 1. To make the cake: Preheat the oven to 350 degrees. Butter a 12-cup Bundt pan; dust with flour, tapping out excess. 2. Into a large bowl, sift together the flour, salt, baking powder, baking soda and cinnamon. Set aside. 3. In the bowl of an electric mixer, combine the sugar and oil, then crack in the eggs and mix until well combined. Add the dry ingredients to the bowl and mix until smooth. Grate the carrots (you should wind up with about 2 cups) and add them to the mixing bowl. Mix until the carrots are completely incorporated into the batter. 4. Pour the batter into Bundt pan. Smooth out the surface of the batter with a spatula, then bake the cake for 40 to 45 minutes, until the cake is set. 5. Turn the cake out of the pan and allow it to cool completely before icing. 6. To make the icing: Put the butter, cream cheese, powdered sugar and vanilla in the bowl of an electric mixer. Mix until the icing is light, fluffy and smooth. Add the pecans to the bowl and mix until they’re incorporated. 7. To serve: When the cake is fully cooled, spoon the icing all around the top, then use a dinner knife to spread it evenly all over the surface of the cake. Finally, sprinkle extra nuts all over the top of the cake. Slice and serve. Refrigerate leftovers.